"You know of the Rebellion against the Empire?" 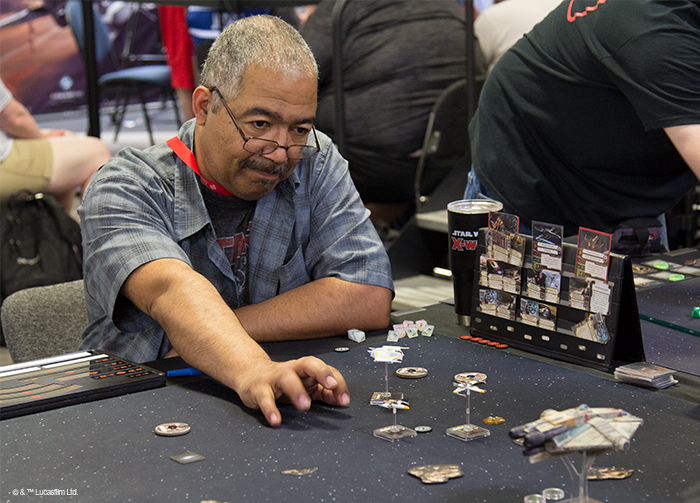 This October 5th – 7th, hundreds of the world's top X-Wing™ squadron leaders will make their way to the Fantasy Flight Games Center for the 2018 Coruscant Invitational, the first major competitive event for the game's second edition. 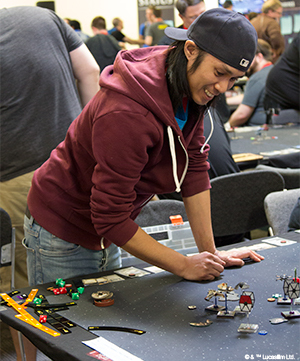 The Coruscant Invitational serves as the culmination of the 2018 System Open Series. Attendees will all have been invited thanks to their performances at the different System Open Series events held around the world. And you—the community—will have a say in how these players fly to battle! Each participant in the 2018 Coruscant Invitational will need to incorporate one "essential" faction-specific upgrade into his or her squadron. What that essential upgrade might be, though—that's up to you. Will you choose an upgrade that invokes one of your favorite scenes from the movies? Will you vote for one that you feel speaks to the essence of what makes your favorite faction unique? Will you target an upgrade that stresses a certain playstyle? 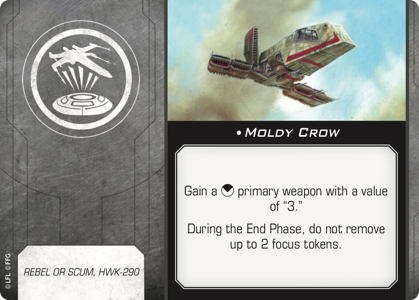 Today, and over the next couple weeks, we invite you to review the faction-specific upgrades headed to X-Wing Second Edition in the three Conversion Kits, and then we'll ask you to vote from four options for each faction to decide which upgrades you'll get to watch players use when you catch them on our Twitch stream during the Coruscant Invitational! 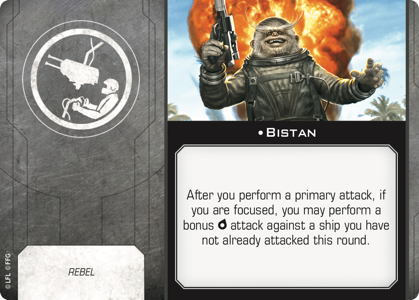 We start with a look at the faction-specific upgrades from the Rebel Alliance Conversion Kit. The members of the Rebel Alliance were freedom fighters who banded together to confront the Galactic Empire's tyrannical rule. But where the Imperial Navy boasted a fleet backed by thousands of Imperial-class Star Destroyers and countless TIE fighters, the Rebels were rag-tag underdogs. The Rebellion was woefully outnumbered and outgunned—but its members were never without hope. Even though the odds were stacked against them, they risked their lives on daring missions because they believed they could make a difference. Like Jyn Erso in Rogue One: A Star Wars Story, the Rebels looked to take advantage of each chance that presented itself—and then to press on to the next chance, and the next, until they had either won or all their chances were gone. 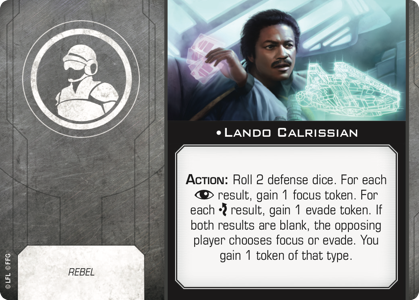 You'll find this sort of hope, bravery, and selflessness reflected among the Rebel pilots and upgrades in X-Wing Second Edition. 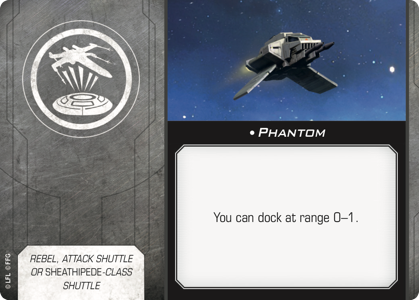 You'll find pilots willing to risk their lives for the cause of galactic freedom. Leaders clever and daring enough to find or create chances for their squadrons to strike. And a host of recognizable characters, all of whom remain committed to the fight—driven by the hope and belief that their actions will help restore freedom to the galaxy. The result is that the Rebel Alliance Conversion Kit gives us a Rebel faction built around individual talent and team spirit. Its members are used to fighting against horrific odds, and they're willing to risk damage to help each other. 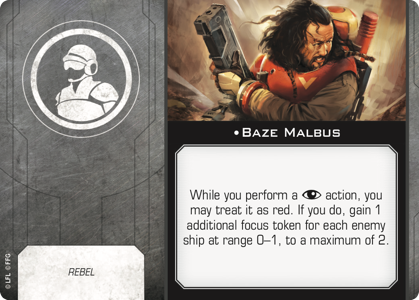 You see this time and again among the 84 ship cards in the Rebel Alliance Conversion Kit, and among its 162 upgrades, 27 of which are considered so essentially "Rebel" that they have been designated for use only with the Rebel faction. 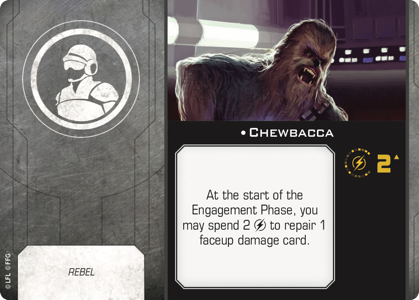 Of the 27 Rebel-specific upgrade cards in the Rebel Alliance Conversion Kit, five are title cards. 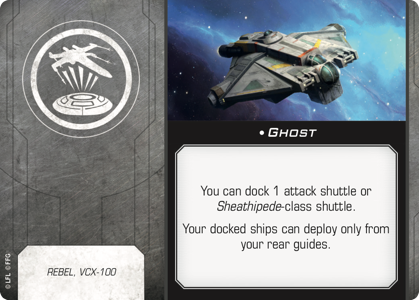 While these named ships—the Millennium Falcon , Ghost , Phantom , Outrider , and Moldy Crow —are all immediately recognizable as Rebel cards, we're not including them in the voting as they would limit list-building too heavily were one of them to win. 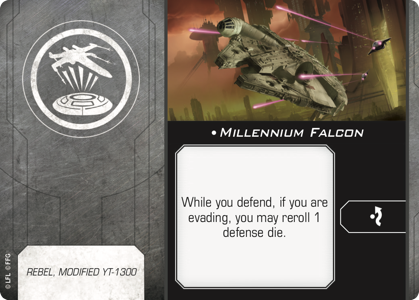 Sure, we all love the Millennium Falcon… unless, maybe, if we have to play five games in a row against the same basic squadron that features the ship. 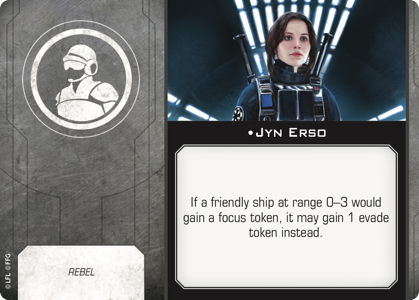 That leaves us with one astromech, four gunners, and fourteen crew to consider—as well as three copies of the single Rebel-only talent, Selfless. 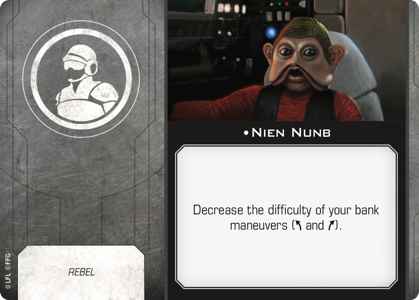 In many ways, Selfless epitomizes both the Rebel playstyle in X-Wing and the Rebel cause in Star Wars. The talent allows a pilot to draw critical hits away from his or her wingmates at range 0-1, risking his or her life for the sake of others. 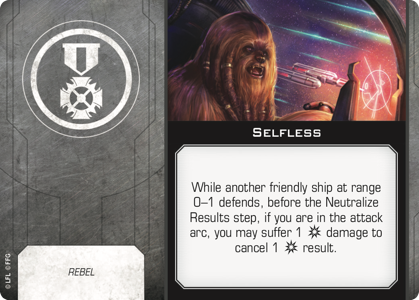 In effect, Selfless prevents your opponent from concentrating all fire on a single ship and works best when you can absorb a critical hit on another ship's shields, rather than seeing the card dealt faceup to the ship your opponent had targeted. The gunner upgrade type, meanwhile, is new to the game's second edition and introduces some fantastic new possibilities. There are four of these gunners in the Rebel Alliance Conversion Kit, and they all pack a punch. 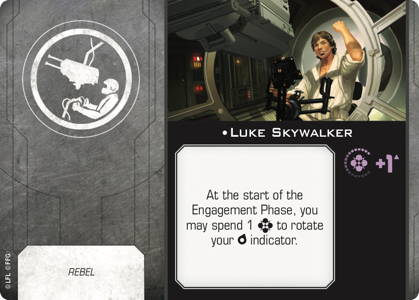 You may have already seen the new Luke Skywalker upgrade, and—given how we've stated X-Wing Second Edition reinforces the importance placed on maneuvering—we've seen these veterans express their concerns that Luke's ability undercuts that importance. Luke's ability is certainly powerful. However, it also comes with a hefty cost. 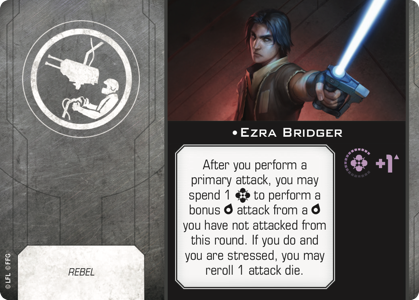 Luke's ability is priced higher than those of Bistan, Ezra Bridger, and Han Solo—even though all those other pilots make it possible for their ships to fire twice in a round. Given the boost in firepower that these gunners can bring to your squadron, it's no surprise that they're among the most expensive upgrades in the game. Apart from Luke, however, each of these gunners does, in fact, reinforce the importance of clever maneuvering. None of them allow you to fire twice from the same turret arc, so they demand that you line up shots from both your turret and primary firing arcs or from different turret arcs… or else they sit silently in the gunner's seat, playing the role of the most expensive and underused addition to your squad. From these options, we're promoting Han Solo to the vote. Not only does Han come with impeccable pedigree, having appeared in both the first Star Wars movie and the most recent cinematic addition to the Star Wars universe, but he allows you to shoot first—at least most of the time. 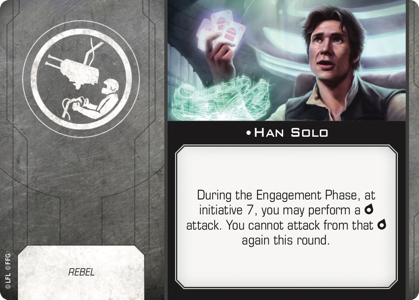 Since pilot initiative caps at 6, Han's ability to shoot at initiative 7 makes him quicker on the draw than any pilot not equipped with tricks or Force powers of their own. 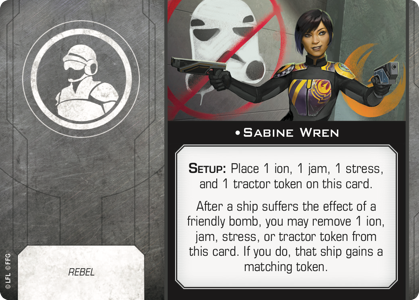 We're also allowing you to vote—if you so desire—for the sole Rebel astromech featured in the Rebel Alliance Conversion Kit. "Chopper" is one of the best-loved characters from Star Wars: Rebels, and he adds a welcome measure of resilience to your Rebel fighters—at a cost. 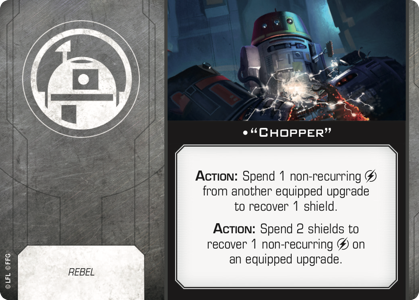 In typical "Chopper" fashion, this astromech can power up your failing shields, but only if you strip that power from your other upgrades. In a pinch, he can even strip your shields to power up other upgrades, such as your Proton Torpedoes. 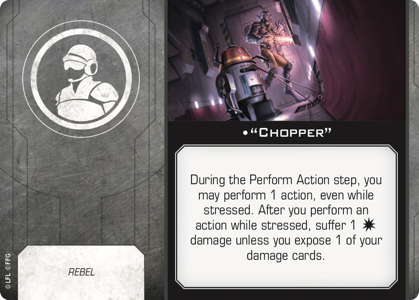 In the end, "Chopper" is a dynamic and versatile upgrade that bristles with all the cantankerous character you'd expect from the astromech. With three of our four options already before us, we have the daunting task of selecting one final voting option from among all fourteen of the Rebel-only crew appearing in the Rebel Alliance Conversion Kit. These include such immediately iconic characters as Lando Calrissian, Chewbacca, C-3PO, Jyn Erso, Cassian Andor, and Hera Syndulla, as well as such fan-favorites as Baze Malbus, Sabine Wren, "Zeb" Orrelios, and Nien Nunb. While the "Chopper" crew offers another great in-game integration of this droid's role and pesonality, we don't want to fill half your voting options with the same character. 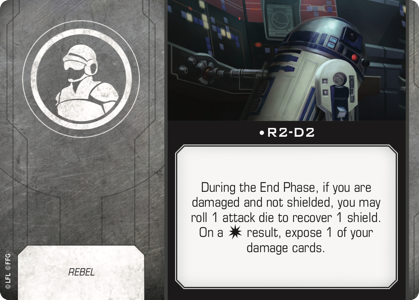 Similarly, while the R2-D2 crew promotes the Rebellion's core theme of shield regeneration, adding R2-D2 to the vote as a crew upgrade would potentially preclude players from running R2-D2 as an astromech. 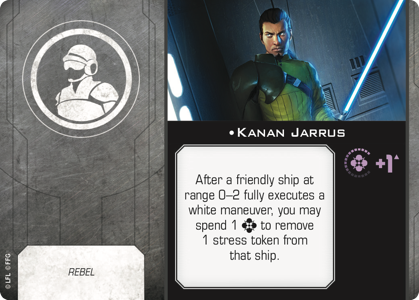 As one of the most notable figures from Star Wars: Rebels, Kanan Jarrus provides an interesting option. 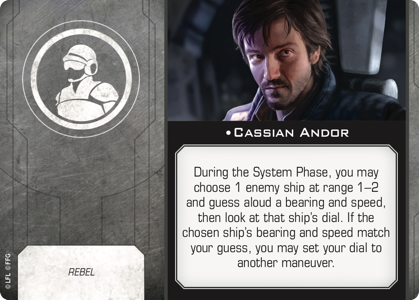 He's the only crew upgrade in the Rebel Alliance Conversion Kit who can add a Force rating to your ship, meaning that if you don't use his Force point to trigger his ability, Kanan will allow you to change one focus result each round into either a hit or an evade result. Ultimately, even though Kanan's ability works for any friendly ship within range—and not just the ship he's aboard—it doesn't evoke the same sense of pioneering leadership that the Leia Organa crew can offer. 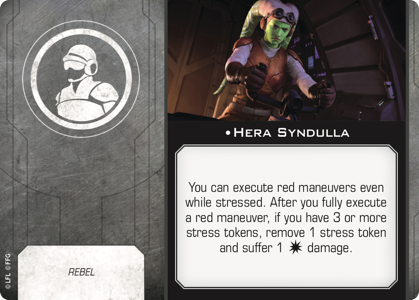 In the Leia Organa crew card, we have one of the most central figures in the Galactic Civil War and one of the best-loved characters in the Star Wars galaxy. We have, also, a far-reaching ability that begs for the exploration of squad-based tactics. 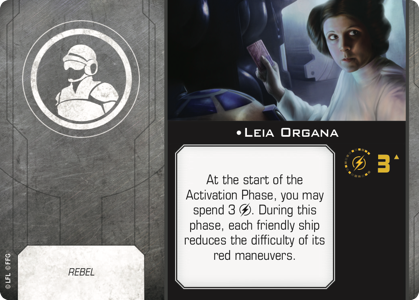 At the start of the activation, Leia allows you to spend all three of her charges to reduce the difficulty of red maneuvers for every ship in your squadron. 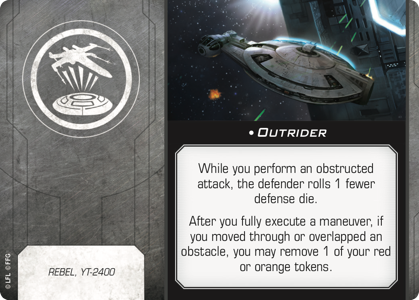 In other words, Leia makes it possible for all the ships in your squadron to perform Koiogran-turns or Tallon Rolls to get behind their targets and still perform actions—to once again lock on target and fire Proton Torpedoes, or to barrel roll into position for a better shot. Leia's ability is a difficult one to use effectively, but it reflects her inspirational presence in the Rebellion. It also reflects an upgrade from her first edition ability, as Leia can potentially trigger her ability multiple times in one game. She recovers one charge at the end of each round, meaning that if the game plays out long enough, you'll be able to trigger Leia's ability twice—possibly even three times—per game. Finally, there's the matter that Leia's ability doesn't just allow ships to perform stress-free Koiogran-turns or Tallon Rolls. She also reduces the difficulty of the Sheathipede-class Shuttle's one-speed reverse, the HWK-290's zero-speed maneuver, or the E-wing's red one-speed turns. Accordingly, even if you don't have a full squadron of X-wings laden with torpedoes by the time Leia recovers all three of her charges, you might very well find tremendous benefit in the ability to plot a cunning maneuver in the tight spaces of close-quarters combat at the end of the game. 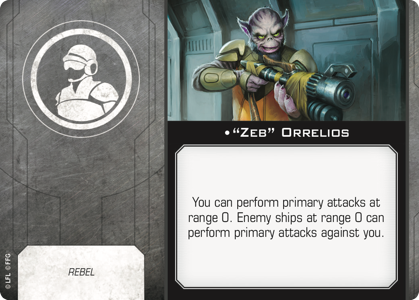 All told, the Leia Organa crew card doesn't just draw its inspiration from one of the saga's best-loved characters; the card translates that character into a leader who permits a wide range of daring and surprising tactics. 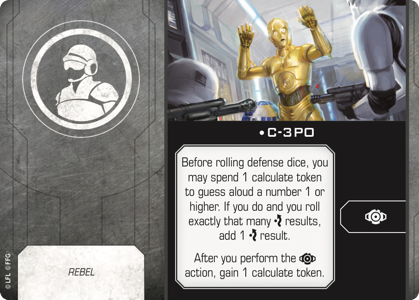 It's no easy feat to choose just four "essential" upgrades from the dozens of thematic abilities and iconic characters represented among the Rebel-only upgrades in the Rebel Alliance Conversion Kit, and reducing these options to just one? That's too much for us alone—we need your help! Find us on Twitter @FFGOP to vote for the Rebel upgrade you most want to see in action at the 2018 Coruscant Invitational. Will it be a character you love? A show of Selfless heroism? Or a card ability you want to see used at the highest levels? Your options include a talent, gunner, astromech, and crew. Whichever you choose, it will feature in every Rebel squad at the 2018 Coruscant Invitational! Vote now. Then come back next week for a look at the Imperial-only upgrades from the Galactic Empire Conversion Kit!